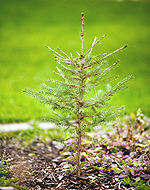 The City of Edmonton Arbor Day tradition began in the early 1950’s. The City distributed evergreen seedlings to all grade 1 students in Edmonton. The Province of Alberta soon stepped up to provide seedlings for every grade 1 student in the province. Each year over 15,000 children receive seedlings. Children grow up with their trees and some people even move their trees when they buy a new house! Tell us your story and what your Arbor Day Tree means to you using this interactive online map: yegTreeMap. How do I submit my Arbor Day Tree story? Create an account with yegTreeMap. Plot your tree on the map. Edit your tree to upload your photo (‘Add Photo’ button) and add your story into the ‘Comments’ field. Choose 'Arbor Day' in the drop-down list under 'Local Projects'.